Spud and I got the call a couple a of weeks ago to come over and look for a gut shot buck. 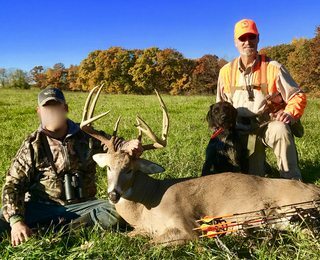 Glad we went, the Buck Gross Scored 190. I got a call yesterday evening about a buck which had been shot low through the guts at 4:30 PM. Spud and I met the Hunter at the pasture edge of the woods at 8:30 am this morning. I interviewed the Hunter and gave him some instructions and we headed towards his tree stand in the thick woods. As we approached the location where the buck was standing when shot, a live healthy antlerless deer jumped out of its bed literally on top of where we needed to take up the wounded buck track. Great! Spud did an excellent job of ignoring the smoking hot scent of the anterless deer that had just run off when I started him on the buck track. He tracked to a high bluff overlooking a creek, went down the bank, crossed the creek and tracked along the far side. The buck was alive in its bed and things got pretty western when it jumped and ran. 300 yards later, Spud had the buck bayed up in thick cover, baying furiously at the bucks head. A 10 pt low 160s Buck. Made a new Friend. Sure enjoy my dog. Pheasant and Quail is the plan for tomorrow. Last edited by AverageGuy on Sun Oct 28, 2018 8:53 pm, edited 1 time in total. That's what I'm talking about! Great story. The Spudster rocks. Nice bucks. Can't use dogs in washington. Makes sense to me, if a person can recover an animal. In Oregon, dogs are legal for recovery, just can’t be carrying a weapon during the recovery. Greg, there is no law that says you can’t take a dog for a walk in the woods. Laws with no teeth. Nice! That first deer in the creek is especially huge. In North Carolina I could use Gus to drive deer towards me if I cared to. Sometimes when scouting for ducks or small game hunting I'll carry buckshot for that reason. That's great. And one reason why versatile dogs are awesome. That's a dandy buck. Would have been a shame to lose it. Great ethical way to find lost animals.here in AZ the forests are full of dead elk at the end of the season. Back and.Low bow hits 90 percent of them. Shame states are more comfortable with hunters shooting another than finding the one the shot. Very nice AG. Regardless of how many times I have put a dog on the trail of a lost deer, it still amazes me to witness the track and recovery of an animal that was otherwise lost. Congrats to you and Spud as well as the hunter. Thank you Gentlemen. Our dogs are amazing in what they can do when given the exposure and training to do it. It is always a high five moment when a dog is able to turn anguish over a lost trophy and meat, into the opposite. 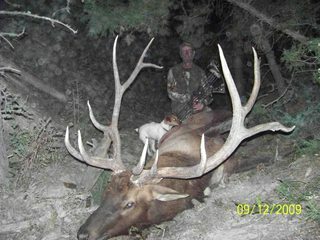 I met a guy in Montana 2008 while hunting elk on a private ranch. He lives in Montana, does everything outdoors, including hounds and has a wonderful JRT that goes everywhere with him. 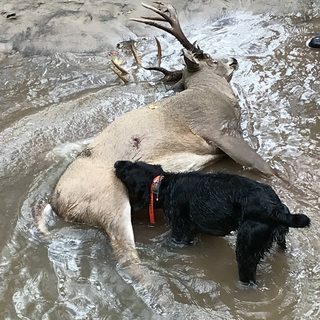 We became quick friends and visited in the evenings of our hunt about every subject in the out of doors including using dogs to recover wounded animals. I sent him the book "Tracking Dogs for Finding Wounded Deer" and encouraged him to work with his JRT so that we could have a tracking dog in camp when/if needed. The following year, when we greeted each other in camp he told me he had been working with Mia and he thought he had her ready to track if we needed her. I said great, and that when I shot an elk, we would put her on the track for training, good hit or bad. 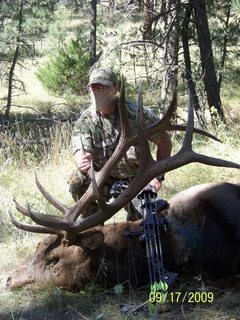 I had great fortune to make a perfect 41 yard double lung hit on a big bull the following evening. I saw the arrow buried to the fletch in the entrance side high in the lungs, angling down into the opposite side lung due to me being above the bull when the shot was taken. The bull wheeled and ran two jumps when it was swallowed up in thick dark timber, heading up a canyon draw. I knew the hit was lethal but also knew that with no exit wound and with the arrow plugging the high lung entrance, the blood trail might be sparse. I quietly left the area as darkness fell and met my Buddy at the ranch road for pickup, per our normal mode of operation. I told him we had a bull for Mia to track and we headed back in with lights and Mia on a thin long nylon cord. We got to the spot where the bull was standing and Mia started on the track, as I followed looking for blood. I was able to find blood and confirm Mia was doing her job correctly. Numerous times my Buddy expressed doubt that Mia was on the right track. It was her first and it is easy to doubt your dog until you have confidence in them. But each time I found more blood and confirmed she was correct. In the pitch dark it seemed the Bull had gone farther than expected with an excellent double lung hit and we were both getting worried. The canyon had narrowed to the point where a large blown down tree blocked our progress forward. Mia started tracking up the steep bank at that point. My Buddy said he was sure she was wrong and I was worried. Everyone "Knows" wounded animals go down hill not up steep inclines. So I stayed down below looking for blood in the pitch dark when I heard my Buddy say something up top. I scaled up to him and shined my light around to see he and Mia looking back down the steep incline. There was my bull piled up on his back in the bottom of the canyon. He had used his last air to climb up the incline to get around the blow down, died and rolled back down to the bottom. Mia had performed perfectly. But the story continues. The next evening another Hunter in camp shot a bull elk at a waterhole. He reported it was an excellent hit in the chest. We put on our headlights and went in to recover his bull with Mia leading the way on her nylon cord. She tracked right to the Bull which jumped up and ran off in the dark. At that point we knew the Bull was not hit where the archer said it was (which is common for those of us called in to recover animals). We took up the track the next morning and Mia again tracked to the Bull, which again jumped up and ran off. That was 18 hours after the Bull was shot so now the location of the hit was really questionable. The next day a grid search was started but quickly called off because of disorganization and the liklihood of lost hunters in remote terrain. The following day my Buddy, Mia and I went out on our own looking for the Bull. Mia again tracked to the Bull which was now dead. Hard to find a happier guy when we returned to camp and informed the Hunter we had recovered his bull. The hit was low and back in the guts. I love a good dog, no matter who owns it. Kent: One thing I admire about you and the recovery of your bull it that you went after it right away and didn't let it turn into a huge pile of spoiled meat. Most guys would have let it sit overnight and recovery at that point is well, pointless. Especially without a tracking dog which means it never would have been recovered till the crows and ravens indicated where it was. I found a cow someone had shot where the arrow almost missed low. A couple of inches lower and it would not have punctured the abdominal wall. I recovered the arrow and still have it. Yea, My bull was a no brainer to track and recover shortly after I shot it. I knew the hit was the excellent double lung we all practice and shoot for, and it was. It was a good training run for the dog and I think she reduced the time it might taken us to find my Bull in the pitch dark canyon without the dog's assistance. The other Bull would have been lost, at least until the birds were on it because the Hunter claimed to have made an excellent hit when it was the opposite. His mis-information made us take up the track on that Bull far sooner than we would have, had he accurately reported the bull was shot in the guts. Without the dog that Bull would have been lost.